Creator of breathtaking custom guitars built to your specifications right here in the USA! 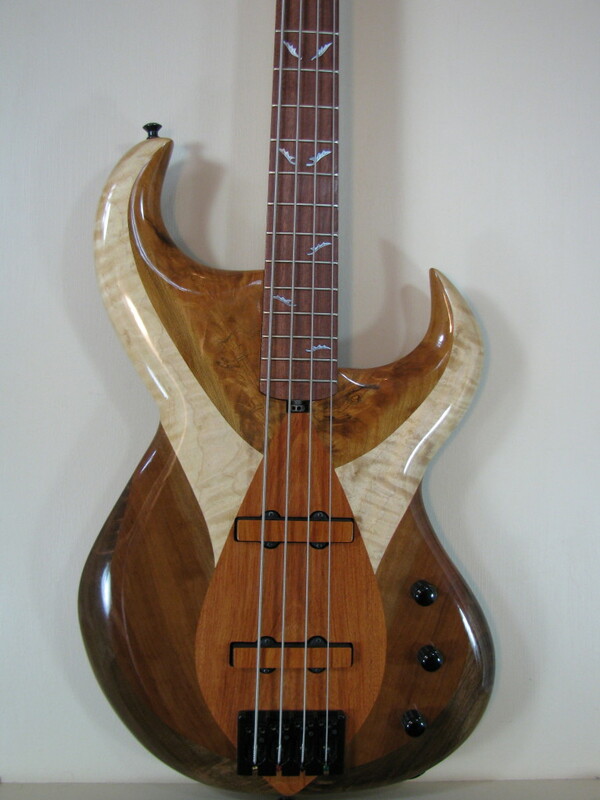 On this site you will be able to view the portfolio of Dan Petrovic‘s one-of-a-kind hand crafted guitars. These custom guitars are built completely from scratch utilizing only high quality materials and components while always attending to every detail to ensure these instruments play and sound as good as they look. Built rock solid from top to bottom, they are guaranteed to deliver years of trouble free service for even the most demanding musician. Ergonomically designed and handcrafted for ultimate playing comfort, these custom guitars are truly unique, well balanced, and can be tailored to any individual’s specific requirements, preferences, and playing style. Dan Petrovic (DJP Guitars) specializes in custom electric guitars, custom electric basses, custom hollow-body guitars, custom steel string acoustic guitars, and custom classical guitars. He carefully and meticulously designs, hand cuts, and installs the inlay on all of his instruments as well as other parts, like truss rod covers, pickup rings, tailpieces, bridges, saddles, nuts, knobs, and whatever adds to the beauty of these handmade guitars. Not only do these custom pieces add to the uniqueness of DJP’s handcrafted guitars, but the durability of these custom handmade parts simply cannot be matched by their prefabricated plastic counterparts. Dan completes all of the finishing process preferring to use French polish for acoustics, and oil-based varnish for electrics. He is also open to using combinations of these finishes and can also apply environmentally friendly water based finishes, if you prefer. DJP modification of a classical guitar headstock, from tuning pegs to machines. Browse around, visit the contact page to submit queries, and check back often for updates. If you are inquiring about a guitar repair, please send good quality photos along with a description of the damage. Also, feel free to visit DJP Artistry, Dan Petrovic’s primary custom woodworking site. Since DJP Guitars is a one man operation, you are guaranteed a one-on-one personal experience when selecting his expertise for your guitar. From the initial concept of your ideal instrument to the delivery of your one-of-a-kind brand new handmade guitar or bass, you will be kept informed of the progress on your new favorite addition to your musical family. The interactive updating process also applies to instrument repairs, so that you can see firshand the care and attention that goes into your damaged guitar to bring it back to life. DJP Guitars does ship custom instruments throughout the country and retains a lifetime warranty on manufacturing defects. Dan Petrovic (DJP) began woodworking at the early age of 5. His fascination and curiosity with wood, music, and wooden instruments led him to successfully complete a year long apprenticeship program under the tutelage of master luthier Sasha Radicic. This is where Dan studied acoustic and electric guitar making, the designs and techniques of the old masters, developed a love of French polish and rosehip jam. It was also during this apprenticeship that Dan competently performed a variety of repairs. DJP met Sasha Radicic at the 2001 Midwest Guitar Show, which coincidentally also attracted the attendance of world renowned acoustic builder Ervin Somogyi, whose website and blog on the intricacies of guitar making has been a tremendous source of DJP’s inspiration. The apprenticeship experience with Mr. Radicic coalesced DJP’s love of woodworking and music, and launched him on the journey he dreamed of – building unique, superior quality, custom guitars. Since then, DJP has studied art, design, music, carving, inlay, marquetry, wood finishing (with a focus on French polishing), and repair. DJP has formerly worked in the furniture restoration/repair and cabinet making industries, which helped him develop this desired, hard-earned, scarce skill set to better serve you and your guitar building and/or repair needs. He will enjoy continuing to design, build, and finish one-of-a-kind handmade custom guitars for the duration of his lifetime. What kind of playable work of art would you like to have built just for you?